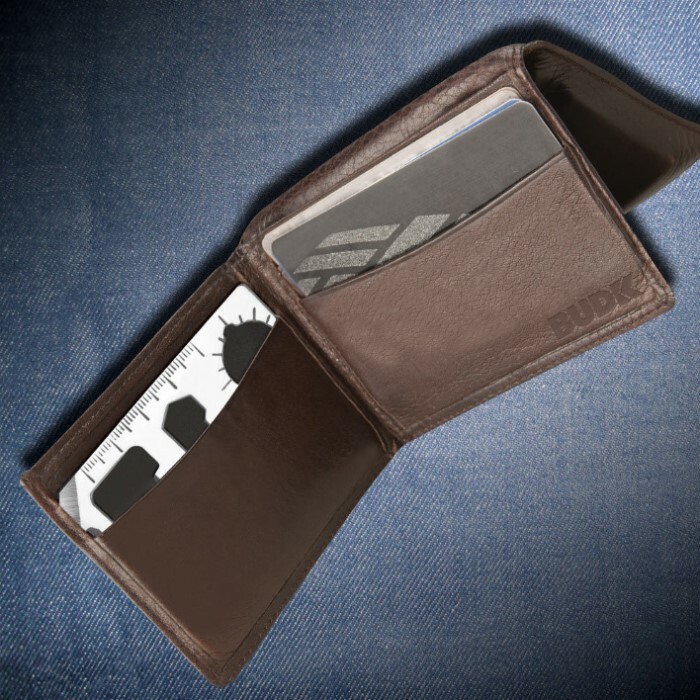 This convenient wallet card tool is one thing you shouldn't leave home without. Includes faux black leather carrying case and slides easily into a wallet. When I got this as a stocking stuffer for my dad and I, I never thought I would use it that much, but it turns out people need a knife, screwdriver, bottle opener and wrench more than you think. I purchased this a while back, and I could say that it functions well. It has not failed me and best of all, it is hidden and sleek. Making it easy to carry and always there when you need it. I got this because of the multiple capabilities it was supposed to have in a small tool! But, I expected it was probably made from some cheap alloy that would crunch when you tried to use it!? I was pleasantly surprised! This thing is SOLID...and compact...and portable...and it fits in your wallet or purse nicely! And the blade on it is sharp, you don't have to sharpen it! It comes in a pouch with a card that has a diagram with numbers on one side, and written explanation of the tool on the other side! This thing is NEAT! Awesome for the money. Thicker than I expected...but in a good way (very sturdy). Bought three one for me, one for dad, one for bro. All 3 of us are happy. Awesome x-mass gift when your in a pinch. The quality of steel is outstanding and the blade keeps an edge well. The plastic holder is kinda cheap but some what unimportant. I love this tool, it's really sturdy and is very handy to have. However, the only problem I have with this tool, is that i'm constantly cutting my finger on the blade when I'm using the other tools. When I had to use the bolt tightener, I had to touch the blade area in order to spin it around. Because of that, I cut my finger. Other times, I would take the tool out of its sheath, and I could cut my finger pulling it out. It's a great tool like I said, but the blade shouldn't be on there. 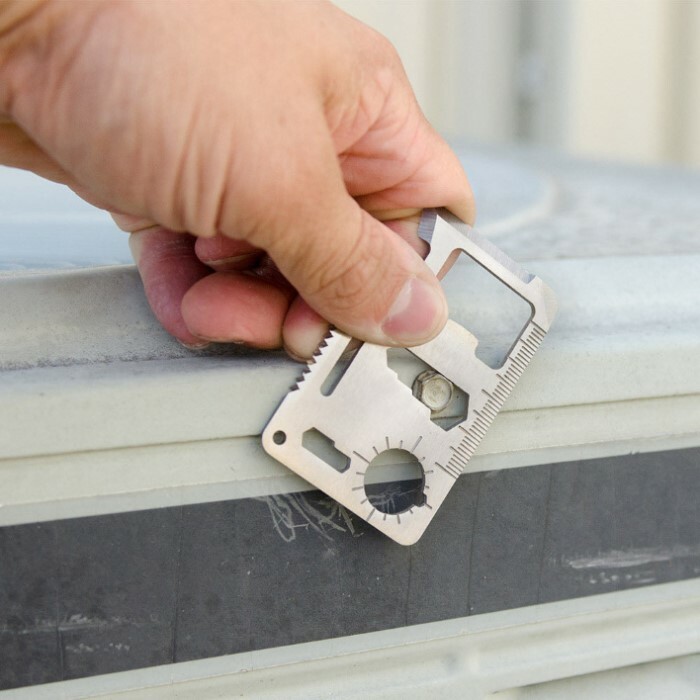 This is a useful little multi-tool that is very portable. I recommend picking one up! It is built really well and in a pinch it could help but it is not designed to be used as a full time tool though. As for recommendations for it I would and I am planning on buying more for my friends, so yes I would recommend it. This is the real deal and not some cheap punch-pressed piece of junk.It is actually functional and can take abuse! 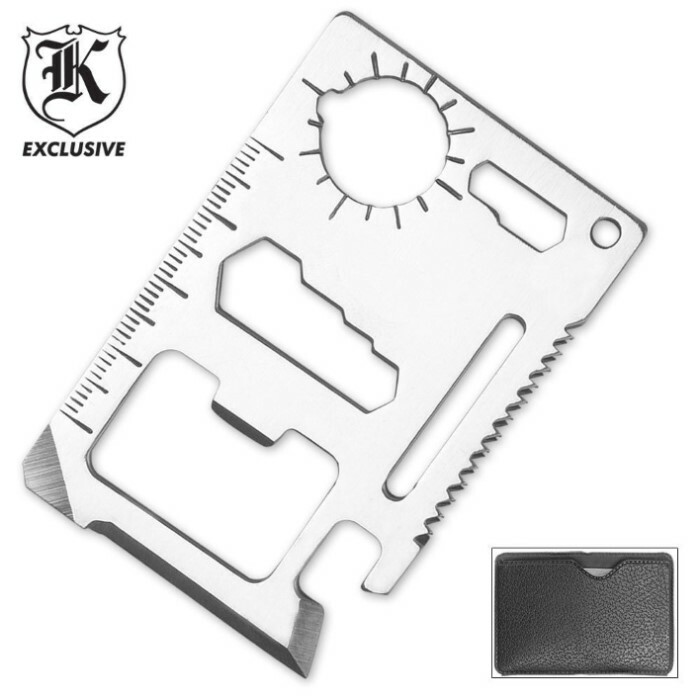 It mic'd .079 (2mm) thick and the cutting edge is sharp and the saw is a cross-cut type that will really saw through something. I probably won't use it much but wanted to have it in my billfold just to be cool.... Batman should have one on his utility belt, definitely! I also bought one for my bro, he's cool like me. Was very impressed with this item. Very sturdy and knife was sharp. Adds some heft to the old wallet. Nice to have something handy. Recommended and great for the price.